The History of the Youth Expeditions. The important and unprecedented event in the world of the Arctic explorations took place on March 14, 2008: the Russian flag was hoisted at the North Pole in honour of the completing of the unprecedented and heroic 84-day ski expedition during the polar night from the shores of Russia to the North Pole. Matvey Shparo and Boris Smolin passed one thousand kilometer way along the drifting ice during the polar night. In the course of their crossing the explorers suggested to carry out the first in the world Youth Expedition "On skis – to the North Pole!" from the Russian drifting Station Barneo to the North Pole. 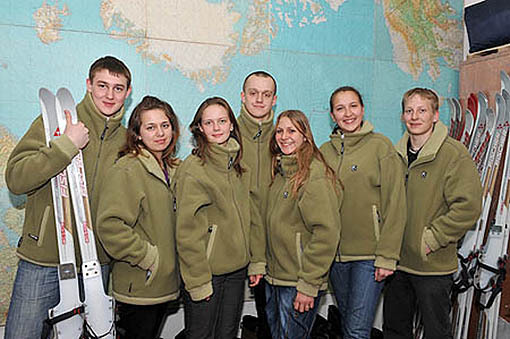 Under support of the Ministry of Sport, Tourism and Youth Politics of the Russian Federation the Expedition was organized two times: in spring 2008 and 2009. Stepan Shevertalov, 16, Novocheboksarsk, Republic of Chuvashia. Elja Matrosov, 17, Konchezero village, Kondopozhsky region, Republic of Karelia. Vener Samarbaev, 17, Kolchurovo village, Baimaksky region, Republic of Bashkortostan. Valeria Zhidkova, 17, Severodvinsk, Arkhangelskaia oblast. Tatyana Kuznetsova, 16, Ruzaevka, Republic of Mordovia. Nadezhda Kurilenok, 17, Pechory, Pskovskaia oblast. Sergey Lomov, 17, Cheboksary, Republic of Chuvashia. Elisey Tretyakov, 16, Glinskoye village, Sverdlovskaia oblast. Training M.Shparo and B.Smolin in the Longa Strait (spring 2007).